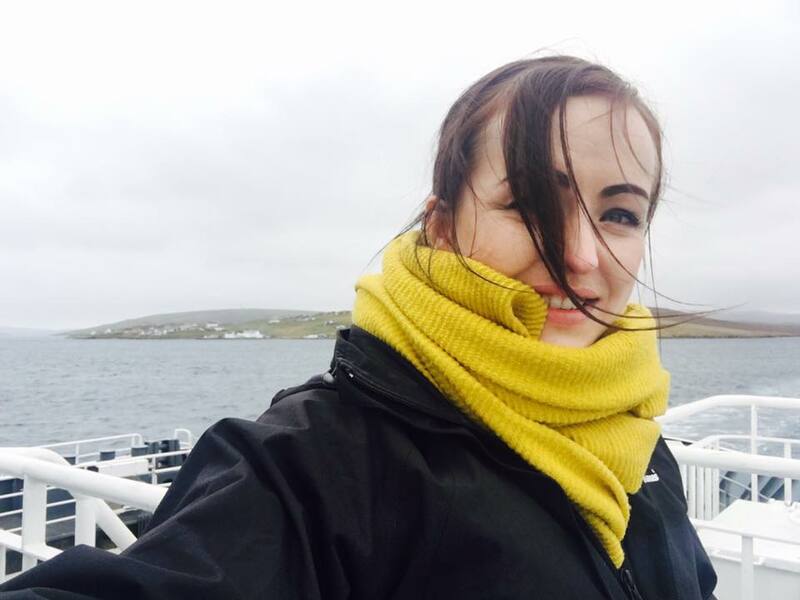 Day 3 of my Music in Hospitals Scotland tour in Shetland: I’m so glad that this tour is taking me to a good deal of the Shetland isles- that means a fair bit of travel… both on land and on sea! 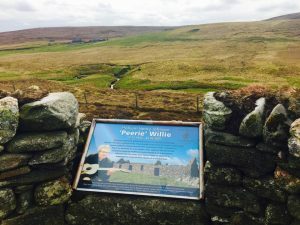 My first stop today was to play a concert in the most Northerly care home in the most northernly piece of land in the British Isles… Nordalea Care home on the island of Unst. 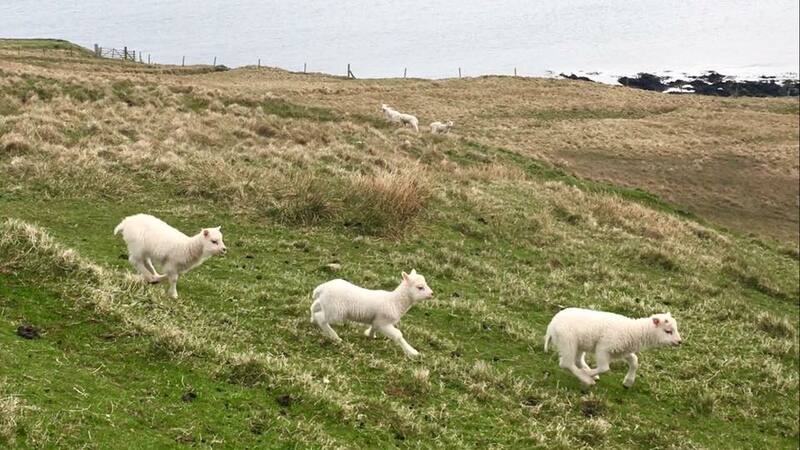 It took 2 ferries to get there but it was very much worth it! I even managed to bump in a friend there… weirdly enough before my concert they were hosting a group of health care professionals from the western Isles, Sweden and Norway so it was a nice surprise to bump into Nicola! I was treated to lunch with the group and enjoyed a performance of some sea shantys by the “Yellmen” who’d popped over for the afternoon. Once the group left, peace descended on the home and I very much enjoyed performing to the small group of residents there. The second concert of the day was at Isleshaven Care centre on the island of Yell…known as the “gateway to the Northern Isles”. They invited friends and family from the community to the evening so it was a full house, but a full house that listened intently. Supper (with many cakes!) 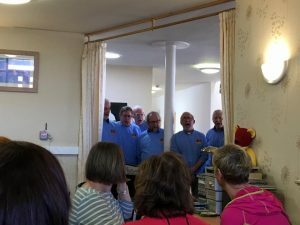 was served after and I really enjoyed the chance to not only let the residents and guests see the harp up close, but having the chance to have a good natter over a cup of tea! The orcas (killer whales!) had been spotted in the sound between Unst and Yell so between the concerts I went on a bit of a hunt with one of the staff members, armed with a set of binoculars. Sadly we were too late… but I’m determined to see one of the pods before I leave! 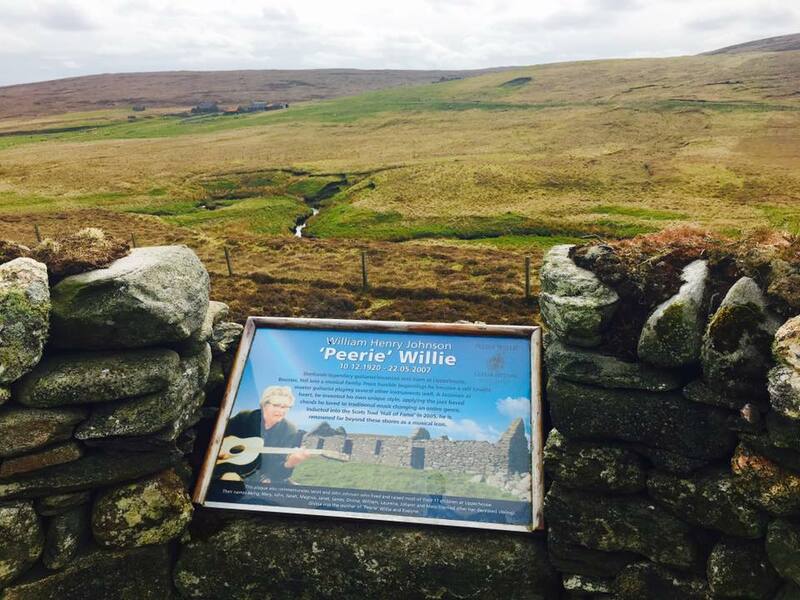 The amazing Shetland guitarist Peerie Willie Johnson was from Yell. He passed away ten years ago this month so I decided to pay my respects at his memorial on the west side of the island. Yell really is a stunning place. 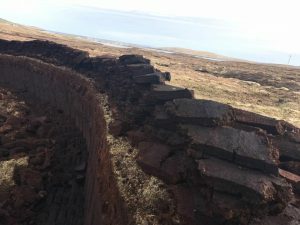 Full of peat bogs and I saw several folk out cutting the peats. It also has _so_many_sheep_ was a bit of a challenge driving about with them (+lambs) wandering across the road all the time! 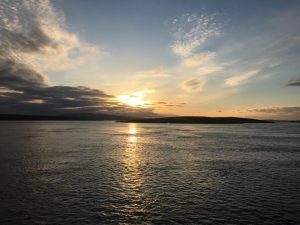 I’ve just boarded the boat now to get back to the mainland… 4th ferry of the day! The sun is beginning to set and it really is a beautiful end to a fantastic day.